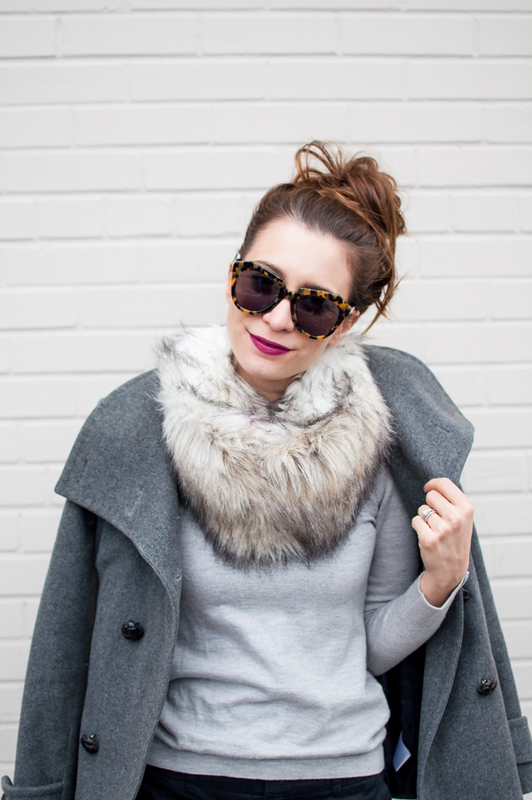 OOTD - Faux Fur Snood | La Petite Noob | A Toronto-Based Fashion and Lifestyle Blog. If you can believe it, I bought this jacket from Aritzia over six years ago and it still looks brand new! They still sell this style in stores (the Howell) and I understand why - it's such a classic cut and silhouette and I can see myself wearing this pea coat for years to come. This is yet another reminder of why it pays to invest in quality pieces that are durable and will withstand the test of time. I'm slowly but surely starting to embrace the mindset of quality vs quantity and I hope to perfect it in the new year. I'm wearing one of my all time favourite lipsticks - Mac's Rebel. This colour is so flattering on all different skin types and is absolutely perfect for Winter when we tend to be a little paler - but man, does it ever get everywhere! Notice the pink-tinged fur on the snood, it's bound to happen! What do you think about the faux-fur trend? Are you taking baby steps? Let me know! I can't get enough of faux fur! Me either lately - it's so fun! You look adorable! I don't have any faux-fur pieces, but that snood is so cute. I do have some vintage fox-fur earmuffs that were my grandmothers though! They are sooo cozy. I wish you posted details for everything you're wearing! I adore your sweater. Hey Kimi - sorry about that, I really should and will be more diligent in the future! The sweater is from Banana Republic. It's from a few years ago, but I think that they always carry this style or one that is similar. Hope that helps! Hi, I know this post is really old but what size is your Howell coat?